Pinch me! Am I in the middle of Paris? One taste of a delicious, buttery, flaky Kouign Amann at the Breadfarm Bakery in Bow Valley, Washington, convinced me I needed to find a recipe for this French pastry. The origin of this taste sensation started in the 1800s in Brittany, France. The Breton name means “cake-butter,” referring to the layers of butter and sugar folded into a yeast dough. Fresh fruit, chocolate, cinnamon, and coconut often fill many Kouign Amann pastries. In a large bowl (or in the bowl of a stand mixer) combine the warm water (it should be about 105°F) with the yeast and one tablespoon of sugar. Stir the mixture and allow it to sit for several minutes, until the yeast dissolves. Add the flour and salt to the yeast. If using a stand mixer, knead the dough with the dough hook on medium-high speed for about 8 minutes, or until smooth and elastic. If kneading by hand, knead the dough for at least 10 minutes, or until smooth and elastic. If the dough is still tacky you can add a few extra tablespoons of flour while kneading. Place the dough into a greased bowl. Cover the bowl lightly with plastic wrap or a kitchen towel and place it in a warm place for about 1 hour or until doubled in volume. Punch down the dough and allow it to rest for several hours or up to overnight. While the dough rests, remove the 6 ounces of butter from the fridge. Place the butter between two sheets of parchment paper and pound it into a rectangle, about ¼ inch thick. Place the butter back into the refrigerator so that it remains chilled. On a lightly floured surface, roll the dough into a rectangle that is also about ¼ inch thick. The dough should be about 10 inches wide and 18 inches long. Place the chilled and pounded rectangle of butter into the center of the dough. Fold the top half and bottom half of the dough evenly over the butter. Once folded, be sure that the folds in the dough are facing towards you. Give the dough its first roll using a rolling pin. Roll the dough out evenly. Be careful not to pinch the edges of the dough, or to press down so hard that the butter begins to squeeze out. Roll the dough until it is a rectangle, almost as large as the rectangle you started with. If the dough sticks at all, use a bit of flour to prevent sticking. Fold the top third of the dough down and the bottom third of the dough up, so that it again looks like a book, with the folds facing you. Wrap the dough in parchment or plastic wrap and place it into the refrigerator for at least 30 minutes to chill. Repeat the above process two more times, each time rolling the dough out, folding the dough into thirds (so that there are three even layers of dough), make sure that the layers are facing you when you roll, and chill for at least 30 minutes between rolling and folding. You can leave the dough like this overnight if you wish, and do the final turn the next morning. For the 4th and final turn, sprinkle a half cup of the granulated sugar on the work surface. Place the dough on top of the sugar and sprinkle one-fourth cup on top. Roll the dough out. Fold the dough once more into thirds, top half down and bottom half up. Chill the dough for 20 minutes. Combine the brown sugar (if using) with the remaining white sugar, Sprinkle half on the work surface, place the dough on top and sprinkle the rest of the sugar evenly over the dough. Roll the dough out into a long rectangle, about 8 inches wide by 24 inches long. Cut the dough into two strips, and then cut the dough into 4”x4” squares. Gather the squares up by the four sides. Place the center into a well-greased muffin tin, pulling the four corners towards the center of the muffin tin, so that it gathers up like a blossoming flower. Repeat this process until all the muffin tins are filled with the dough. Place the Kouign Amann in a warm place to proof slightly. It should begin to puff slightly before you put it into the oven. While the Kouign Amann proofs, preheat the oven to 375°F, with a rack in the center position. Bake the Kouign Amann for about 30 minutes, or until golden brown. Remove them from the oven and allow them to cool slightly. Only allow them to cool enough so that you don’t burn yourself on the caramelized sugar when trying to handle them. Remove immediately from the muffin tins. If you leave them in the muffin tins until they cool completely they will be impossible to get out. Serve them warm or at room temperature. Makes 12 individual cakes. Use the highest quality of butter available. Use salted butter to balance out the sweetness. Work in a cool kitchen when rolling butter and layering it into dough. If it warms and begins to melt into the dough, you won’t get those nice, flaky layers. Try to avoid touching the dough too much and work quickly. Do not layer your sugar into the Kouign Amann until the final turn. Sugar absorbs moisture, so if you layer the sugar into the dough too early, it tends to get very wet and tacky. This makes it harder to roll and fold the dough. The best result comes from adding it during the final turn. 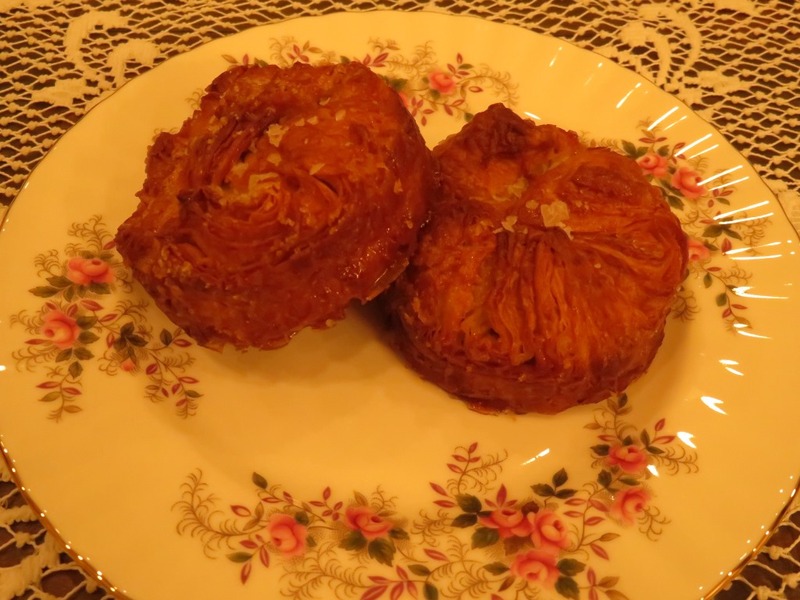 Enjoy making a batch of Kouign Amann’s and share them with family and friends. Do you have a favorite pastry you like to make or buy at a bakery? Is it plain or filled with something delicious? *This recipe by Marisa Churchill (with slight modifications) first appeared on Stitches Thru Time Writers. This entry was posted in French recipes, Kouign Amann, Recipes, Stitches Thru Time Writers and tagged Brittany, Deb Garland, Deb Garland's Scripture & Story, France, French pastry, http://www.blog.debgarland.com, http://www.debgarland.com, Kouign Amann - A French Pastry Recipe, Stitches Thru Time Writers. Bookmark the permalink.